I love the new Eala Dress from Schadenfreude. 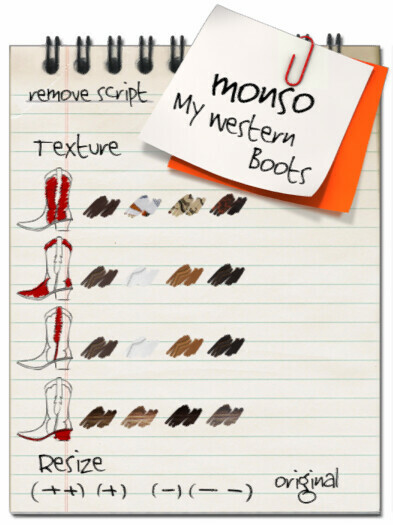 I knew I wanted to make a Western inspired outfit, so I could wear it with the My Western Boots and My Western Hat from Monso. This Western inspired outfit also gave me a chance to play with the HIShorse pose prop from HISpose. This mesh horse is scripted with 6 poses (sitting & standing) and is texture/color changeable. Aren’t these boots amazing? They’re mesh, and includes a HUD to change texture on all the components. I love this look, everything is super pretty. The horse is amazing looking as well! wearing it. hard to see, but it comes with a version that’s worn on the head, and one that’s tied behind the neck. eager to find Monso at Vintage fair – which Sim are they on so I can narrow it down? Found it on the corner in CHIC Sim – got the boots and love them.